Robert Colescott’s massive paintings evoke powerful emotions and thoughtful contemplation. For the past thirty years, Colescott has engaged themes of race, gender, and social inequality. His art is both highly charged and also intrinsically beautiful. In 1997, Colescott was the first African American painter to have a solo exhibit at the Venice Biennale in Italy. 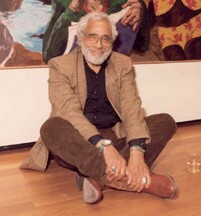 His work is in the permanent collections of many museums, including the Museum of Modern Art, the Metropolitan Museum, the Seattle Art Museum, the Studio Museum in Harlem, and the Oakland Museum. Colescott was born in 1925 in Oakland, California, where his father was based as a Pullman porter. In the same year, the Brotherhood of Sleeping Car Porters (BSCP) organized workers and slowly built support to become the first African American union chartered by the American Federation of Labor in 1935. The politics of race and social justice were central to everyday life in Colescott’s Oakland. At thirteen, he journeyed across San Francisco Bay to Treasure Island, in order to watch Diego Rivera paint his mural, Pan American Union, for the 1939 World’s Fair. Art and politics also came together along Oakland’s 7th Street, where members at BSCP headquarters distributed vinyl records cut by jazz and blues musicians from across the country. There was a pulsing music scene on 7th, with well-known clubs like Slim Jenkins, Esther’s Orbit Room, and Harvey’s Rex Club. Both of Colescott’s parents were accomplished musicians who played jazz, blues, and classical music. Colescott left Oakland to fight in the 86th Blackhawk Division during World War II. He returned to the Bay Area and the University of California at Berkeley, on the GI Bill, and earned his B.A. in 1949. After receiving his degree, he spent a year in Paris at the Atelier Fernand Leger and then came back to Berkeley, earning an M.A. in 1952. He taught in the Seattle public schools then moved in 1956, when he was appointed Associate Professor of Art at Portland State University. Since that time, he has taught at a number of colleges and universities. His most recent appointment was as Regents Professor of Art at the University of Arizona. Until the mid-1960s Bay Area figuration painters like Richard Diebenkhorn influenced Colescott. In 1964, he spent a year as Faculty Artist in Residence at the American Research Center in Cairo. Colescott began a period of transformation, as his work grew more graphic and explicitly political. He received international recognition for his satirical re-envisioning of American history in paintings like the 1975 acrylic George Washington Carver Crossing the Delaware. His more recent work brings together personal issues with political life. For example, the 1992 painting A Fool There Was, Europe—Africa has multiple meanings that are at once general and very intimate. Colescott paints both biography and history with unwavering humor and honesty. Robert Colescott passed away in 2009. Chris Rhomberg, No There There: Race, Class, and Political Community in Oakland (Berkeley: University of California Press, 2004); Peter Selz, Robert Colescott: Troubled Goods (San Francisco: Society for Art Publications of the Americas, 2006).